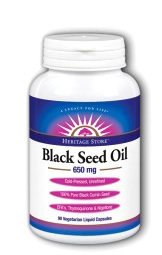 Black Seed Oil Capsules - 650 mg, 90 vegetarian liquid capsules (Heritage Store) - Penn Herb Co. Ltd. Known as the "seed of blessing", research suggests this powerful antioxidant oil offers nutritive support that may benefit a healthy immune system when used regularly. Health practitioners around the world use Black Seed oil's unique essential fatty acids to help balance the body. Our 100% pure Black Seed oil is cold-pressed in accordance with superior standards, and delivered in vegan capsules. AMOUNT PER SERVING (2 CAPSULES): Calories from fat 12.7; Trans Fat 0 mg; Black Cumin Seed Oil typically provides 24% Omega-9, 58% Omega-6, 11% Palmitic Acid, 2.5% Stearic Acid, 3% Eicosadienic acid, up to 1% Nigellone and Thymoquinone (TQ). OTHER INGREDIENTS: Beeswax, Rosemary 12% LE, Vegetable Cellulose, Purified Water. Immune system health; unique essential fatty acids help balance the body; phyto-nurishing properties soothe and cleanse digestive tract. Use only as directed. Take 2 capsules up to 2 times daily with food. May be refrigerated if desired. DO NOT USE IF PREGNANT. KEEP YOUR LICENSED HEALTH CARE PRACTITIONER INFORMED WHEN USING THIS PRODUCT.